The Chipotle Cultive Chicago Festival is back for a second year on Saturday, Sept. 15 in Lincoln Park. The one-day festival is free and features celebrity chef cooking demonstrations, live music, food artisans and more. Besides having a good time, the purpose of the festival is to share an appreciation for fresh and affordable food made with sustainable ingredients. In addition to Chipotle’s offerings, there will be plenty of beer selections as well as food samplings from Chicago-area artisans. Festival hours are 11 a.m. – 7 p.m. For directions on how to get there, click here. 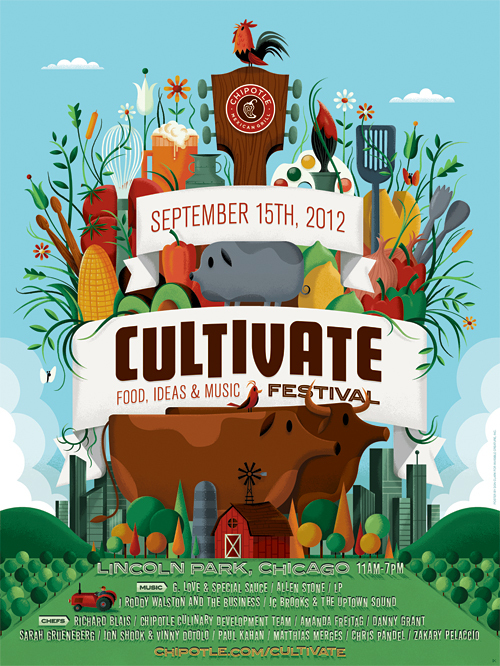 The second and final Chipotle Cultivate Festival of 2012 will take place Oct. 6 in Denver. National Guacamole Day is September 16th! Missed LP’s set at Lollapalooza. This should be fun.